What’s up all you comic lovers you, welcome back to my arts and entertainment blog. I just heard some pretty cool news about the upcoming ‘Venom’ movie starring Tom Hardy as Eddie Brock. It turns out that he will not be the only alien symbiote in the movie, with no one on the card for the role at the time. Sony studio executives had previously stated how they intended to make multiple Spider-Man spin offs so choosing these two similar iconic villains seems like a great place to start. So far we have no idea if the webs slinging foe of Venom (Spider-Man), but that essentially guarantees that we will see someone else from the vast history of our friendly neighbourhood superhero. 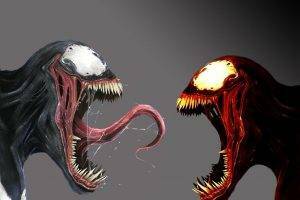 Lots of fans have expressed their hopes over social media that this void will be filled by none other than the child of Venom himself, Cletus Kasady who is better known around Manhattan as Carnage. For those unfamiliar with the villain, Cletus Kasady had a very troubled youth that including murdering his grandmother by pushing her down the stairs, as well as attempted murder of his mother when she was in the bath. This lead to him being put in a youth home where his behaviour deteriorated and by the time he reached adulthood, Kasady had murdered at least 11 people. He was sent to Ryker’s island where he met Eddie Brock and was exposed to the alien symbiote offspring left in Brock's cell. Carnage escaped prison and went on a killing spree before being stopped by Spiderman. Spiderman found that carnage was too powerful for him on his own and enlisted the help of Venom to stop Carnage. The pair were able to stop the destruction, but the symbiote has bonded to Cassady's body via a small cut that allowed it to bond with his blood giving Carnage his signature red coloration.